Lorex is a security camera manufacturer that distributes their cameras through retailers and online channels. Their products are targeted for both small business security as well as residential houses. The company was founded by Bernard Klein in 1991 and was bought out by a company called Strategic Vista International in 1996. It was then bought by FLIR systems in 2012 which is a company that makes thermal imaging cameras and went on to acquire Lorex Technology. The company received a bunch of media coverage over an incident in Santa Clara County over an inmate brawl. Sherriff Laurie Smith contacted county officials in an attempt to get more security cameras installed in the jail, but was told that it would take up to two years and twenty million dollars. She then bought a Lorex security camera system out of her own pocket and was able to install them on the night prior to the disturbance in the jail. Although Lorex is one of the leading manufactures in the security camera industry, they don’t come without their drawbacks. A quick Google search on some customer experiences might be enough to scare you away from using them completely. Apparently, they have some seriously bad customer service. There are complaints of customers getting completely incorrect orders in the mail and having the Lorex customer service representatives pass them around and hang up on them until they give up. Other than this, they have some pretty good ratings — on the physical products that is. It’s important to know that if you do experience a problem with you equipment, that you are most likely on your own. One of the most distinguishing factors that make Lorex stand out from the competition is their large variety of different types of cameras. 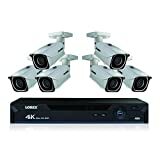 If you already have a pretty good idea of what type of security cameras you’ll need, you can go to Lorex’s website right now and probably find what you’re looking for. They’re going to have cameras in just about every resolution you can think of. They have wireless and wired security cameras that both connect to DVR’s and NVR’s. They also have a huge variety of security camera packages to suit anybody’s home security needs. Lorex has two main types of surveillance systems, analog DVR that use a coaxial cable to run video to a digital video recorder and IP NVR system that run the video over an Ethernet cable to a network video recorder. Both options will give you centralized power to all of your cameras which will give you the ability to easily put your entire surveillance system on a battery backup in case of a power outage. IP NVR camera systems will be able to record at a high resolution and frame rate and are a wider used technology in the industry. Depending on what you’re trying to record, resolutions can be pretty important. If you’re worried about someone stealing your front porch packages for example, you’ll probably want a motion activated camera that has a super high resolution, a wide angle lens, and night vision. Having your cameras record at such a high resolution will help you record a lot more detail. The main problem with recording at such a high resolution is going to be storage. If you plan on storing your video for long periods of time you will need a huge amount of storage space at this resolution. They also don’t have wireless cameras that can stream video over your network at these resolutions yet. While other companies do have 4k wireless cameras, you will almost always have to upgrade your wireless network infrastructure to handle such a large video steam. They are also a lot more expensive than regular 1080p or 720p cameras. If you don’t need to record at super high resolutions, then it’s probably a good idea to settle with regular HD security cameras. There’s a reason it’s been the golden standard for video resolutions for so many years. It’s a lot easier to store and a lot cheaper to make. On top of the lower price tag, you can also get wireless camera systems that will work without having to run wires through your walls. They great thing about this company is how many options you’re going to have. Once you figure out what type of camera system you want, then you need to decide what type of cameras you will need and how many. They have packages that include both bullet cameras and PTZ dome cameras. They even have packages with up to 16 cameras. So if you have a really large area that you want to make sure is completely secured, Lorex has you covered. Interested in integrating your security cameras into your other security features? Contact Protect America and ask them how they can secure your entire home with fully customized security solution.